Marked "Hawkins & Peale's Patent Polygraph No. 57," this machine was used by Jefferson from 1806 until his death. Jefferson first acquired the letter-copying device he called "the finest invention of the present age" in March of 1804.1 Invented and named by Englishman John Isaac Hawkins, the polygraph used the principles of the pantograph, a draftsman tool for reducing and enlarging drawings. The writer's hand moves one pen whose action is duplicated by the second one, producing a copy strikingly like the original. 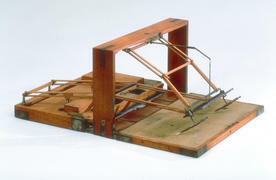 A second Jefferson Polygraph, made in England for Hawkins, survives at the American Philosophical Society. It was given by Jefferson's grandson-in-law and last secretary, Nicholas P. Trist. Dimensions 10 x 24 1/4 x 17 in. Thomas Jefferson to James Bowdoin, 10 July 1806, Albert Ellery Bergh, The Writings of Thomas Jefferson, 11:118. Bedini Copying Machines, provides an excellent account of the development of the polygraph and Jefferson's championing of it. Thomas Jefferson to Charles Willson Peale, 15 January 1809, Peale Papers, 2, Pt. 2, 1168-69.